The new DFM Telescope Control System (TCSGalil™) has been redesigned to use a digital motor controller and 25 bit absolute encoders. The new TCSGalil™ allows us to use control computers without ISA slots and has eliminated other obsolete part dependencies. Using ASCOM drivers for TCSGalil™, Focus, and Dome, TCSGalil™ may be commanded using TheSkyX, FocusMax, and ACP. We optionally provide satellite tracking software to drive DFM Engineering Telescopes. 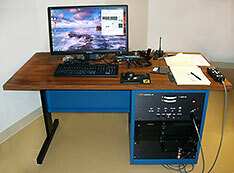 The DFM Engineering TCSGalil™ provides a user-friendly interface to the telescope. 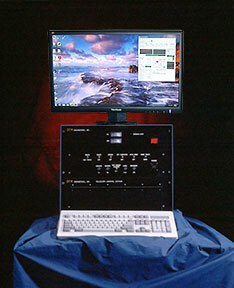 Utilizing an IBM compatible computer with a display, keyboard, and mouse, you have continual position display, status reporting, and an easy-to-use, menu-driven command set. Our pointing model corrects for precession, nutation, aberration, atmospheric refraction, mount misalignments and flexure. Typically, the DFM Engineering TCSGalil™ and pointing model will achieve 10 to 20 arc- second blind pointing to a 60° zenith distance. TCSGalil™ operation is simple. Commands are divided into four submenus: initialization, movement, rates and miscellaneous. All commands are available to your external computer, allowing you to create your own custom user interface where TCSGalil™ becomes a peripheral to your computer system, allowing integration with your own observing program.